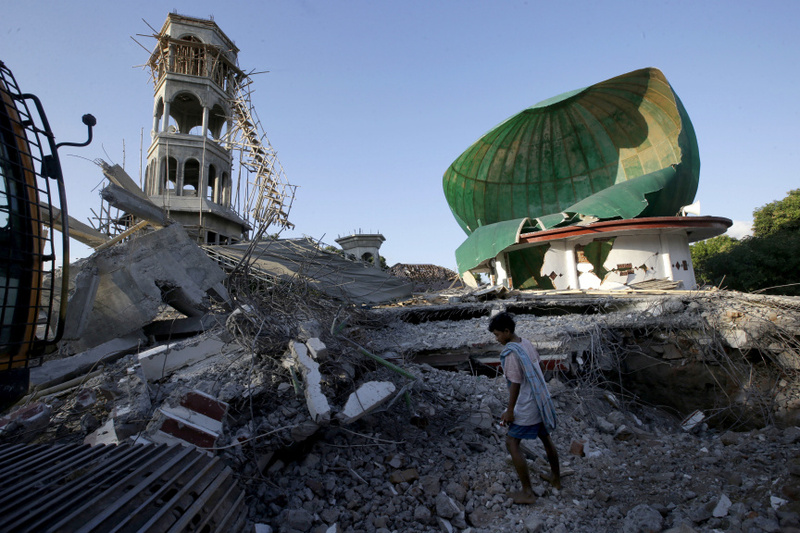 LADING-LADING, Indonesia (AP) — Indonesian soldiers have pulled a man alive from the rubble of a large mosque flattened by an earthquake, while thousands of homeless locals wait for aid and stranded tourists camp at beaches and in the lobbies of damaged hotels. The north of the island of Lombok has been devastated by the magnitude 7.0 quake that struck Sunday night and rescuers are faced with thousands of damaged buildings while still struggling to reach all the affected areas. Video shot by a soldier shows rescuers shouting "Thank God" as a man is pulled from a space under the Jabal Nur mosque's flattened roof Monday. "You're safe, mister," says one of the soldiers as emotion overcomes the saved man. Authorities expect the death toll, which stood at 98 on Tuesday, to rise.